Through the darkness of our lives, we may come to see, by the light of the Son. By the Power of God, we must relect the light of Christ through lives of prayer and joyful service. For lives which do not give the light of Christ increase the darkness. 1. Use the various links listed under the title bar at top. Links are simply underlined page names. Place you cursor on the link of interest and simply left click your mouse to view the page of interest. 2. Should you wish to Listen to a sermon or music click on the Listen In link and then the selection of interest. 3. If you want to view our calendar of events - click on Coming Events and review our list of events for the year. 4. For Daily support click on Daily Prayer and view prayers, artwork and you tube music videos to reinforce your belief. 5. Should you be interested in supportive books, videos or CDs of past church services - click on Library to see a listing of recent additions to the church library and then visit the library to access the materia of interest. 6. Likewise, you can access Member Posts, Pastor Terry, About Us, Activities and Church News. 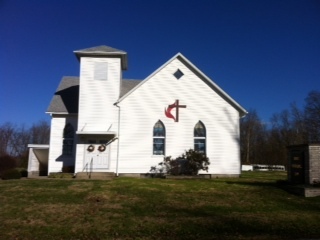 Pastor Terry Kamman and the congregation of Selvin United Methodist Chuch wish you a hearty WELCOME! Review our site to learn about our church family and activities. We encourage your visit. Pastor Terry has focused on personal testimony during this Lenten period. During the Wed. March 19th Lenten service, Elaine Dewald and Terry Bond offered testimonies of GODs' influence in their lives. Libby offered a poem, To hear these contributions go to the listenin.html page. "I am the light of the world Whoever follows me will never walk in darkness but will have the light of life"